When your trip to Australia comes to an end, you’ll be left with many amazing memories. But why not also bring a little piece of Australia back with you in the form of a souvenir or gift? To help inspire your souvenir selection from your trip of a lifetime, here are some of the traditional and quirky treats we brought home from our ‘Wonders of Australia’ tour. While used as a toy in other areas of the world, as you explore Australia and learn about the Aboriginal people, you’ll learn that the Boomerang was actually an important weapon used to hunt and catch prey. Australians now also use a Boomerang as a fun activity. Still, it makes a great Australian gift thanks to its interesting history, which you can share with family and friends back home. 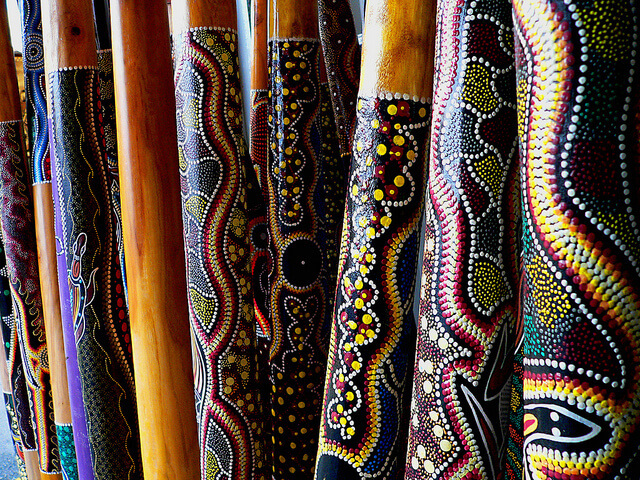 A classic Australian souvenir is the musical Didgeridoo – an Aboriginal woodwind musical instrument, over 1,500 years old. It was tradition for only males to play the instrument, however today many women will play the Didgeridoo, which shows how empowered women have become through Aboriginal culture. If you want to think outside the box and avoid the traditional Australian souvenirs, then Vegemite is one of our quirkier Australian gift ideas. Vegemite is the Australian alternative to Marmite, and similarly, is an acquired taste. So why not take a jar back home to give your family a little taste of Australia. The renowned bush tea is one of the great souvenirs to buy in Australia for a tea connoisseur. The tea is predominantly grown in the foothills of the majestic Daintree Rainforest and then sold throughout the county. From the regular black tea to the lemon myrtle, there’s an array of flavours to try. Bring home bush tea and it will be the perfect beverage to enjoy as you share your travel experience with friends and family. If you are still wondering what to buy in Australia as a souvenir, perhaps investing in a lovely photo of you holding a Koala could be the ultimate keepsake. Now whilst we wouldn’t recommend holding a wild Koala, many national parks offer this experience with a professional photo included. The iconic Australian flag can be found on pretty much any item in a souvenir shop. It’s also the perfect place to look for fun novelty gifts too. With so many wonderful and weird souvenirs to bring home, it’s a good idea to also think about the different custom restrictions to consider, as you won’t want to have to leave any keepsakes from your Australian adventure in the airport. Whichever souvenirs or gifts you decide to bring back from your trip, we’re sure they’ll always hold a special place in your heart and bring back many incredible memories.